Traditional spring cleans may be out of fashion – but it’s still a good time to clear any lingering winter cobwebs and clutter. The brand quizzed 2,000 people – and found that 38% believed the notion of spring-cleaning was dying out. On top of that, only half of the people polled set aside time each week to clean their home, and three in 10 admit they only manage to squeeze in a few chores at the weekends. “With spring around the corner, it’s the perfect time to re-evaluate your home, de-clutter and get it organised,” says Nicola Lewis, aka pro sorter-outer of stuff, This Girl Can Organise (thisgirlcanorganise.com), who offers a professional home organiser service and counts celebrities including Gemma Collins among her clients. Add to that glow of satisfaction at the end of a good clean by knowing you’ve used planet-friendly products. There’s a wide variety of eco-friendly ranges out there these days – or you could Google DIY recipes and make your own (that way you can avoid excess packaging and harsh chemicals altogether).The National Trust’s new range of household cleaning items is made in the UK and uses a combination of natural ingredients, fragrances and 100% bioplastic bottles. There’s a homely, nostalgic feel to vintage-style cleaning kit – even though it might remind you that in the past you’d have been spared the annual cleaning chore, which would have been delegated to below-stairs servants! Companies such as Re-Found Objects specialise in reclaimed, vintage and hand-made household items, meaning you can stock up in a more sustainable way too. 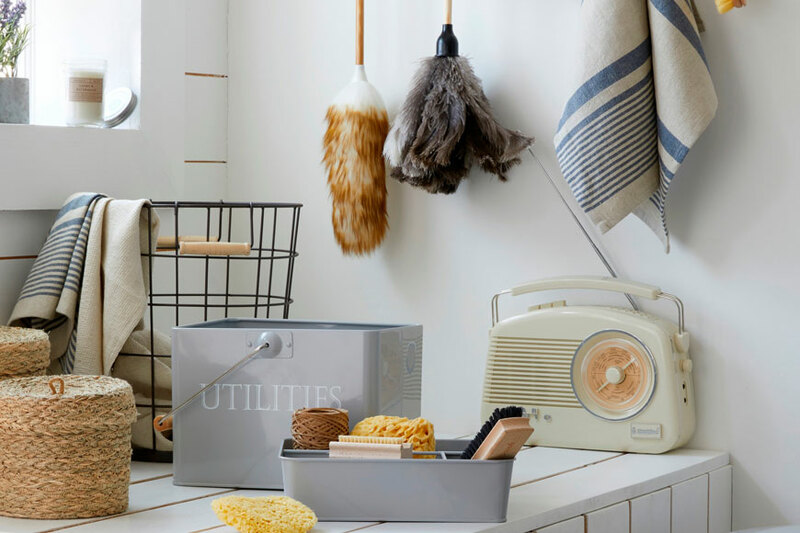 Dunelm’s chic Housekeeper’s range is full of vintage-inspired designs too – including a Housekeeper’s Lambswool Duster, £6.99; Feather Duster, £7; Utilities Grey Storage Tin, £15, and Housekeeper’s Wooden Airer, £29.99. Whatever task you’re tacking, ensure you’ve got all the right tools for the job at hand from the start, so your enthusiasm doesn’t wane as you search for that missing dustpan or broom. “It’s a little-known fact that you should actually clean some mattresses every six months to prevent dust mites, dead skin and dirt accumulating,” says Neil Robinson, chief sleep officer for bed specialists, Sealy UK. If you want to try it, pour a small amount into a sieve and sprinkle over the mattress aiming for an even dusting over the surface – apply more in areas which are particularly stained. Leave it to air for a few hours, or ideally for the whole day, and then vacuum away. However, be aware that some mattresses – including Sealy’s mattresses containing Purotex smart fibres, which have self-cleaning properties – are unsuitable for cleaning with baking soda. “Houseplants are brilliant anti-pollutants and help to increase oxygen levels. For me, stepping into a room of lush and leafy greenery is a definite mood booster,” she enthuses. Bishop’s top tip: Don’t overlook existing houseplants in a spring clean. Wipe leaves with a damp cloth to help remove dust and promote good health. Remove yellowing foliage and trim damaged leaves of larger plants with sharp scissors. Houseplants may also need re-potting and feeding in spring, and some, such as orchids, need specialist feeds to encourage fruits and flowers rather than foliage.